Douglas Werner, John L. and Genevieve H. McCain Chair Professor in Electrical Engineering, along with his current and former graduate students, J. Daniel Binion and Zhi Hao Jiang, respectively, worked jointly with Erik Lier and Thomas H. Hand from Lockheed Martin Space to dramatically improve the design of the conventional short backfire antenna by significantly increasing its aperture efficiency (gain), without affecting its rugged and compact design, nor increasing its weight. This type of antenna was originally developed in the 1960s at the Air Force Research Lab. Since then, it has been used in many ground, sea and space applications, perhaps most notably in the communication between NASA and the Apollo spacecraft, and it is still in use on terrestrial communication antenna towers today. However, few significant advances have been made to this decades-old design. "To use it for space, it's important to have the overall best performance because it costs a lot to develop and fly payloads, and you only get one chance," said Lier. "Our antenna is smaller, lighter weight, has higher efficiency, is more mechanically robust than the heritage designs used on GPS satellites, and can withstand the tough space environment." Werner concurred, adding, "We were able to engineer the electromagnetic properties to meet the stringent radio-frequency (RF) requirements without sacrificing other operational requirements that are unique to the space environment." These properties are made possible through the use of metamaterials. Compared to conventional short backfire antennas, the new antenna offers a one decibel increase in gain (25 percent increase); a hexagonal shape instead of the circular shape, which results in an additional gain increase when used in an array antenna application; and dual band capability that allows the antenna to operate with high efficiency at the two frequencies required for GPS applications. The paper that details their research and results, "A metamaterial-enabled design enhancing decades-old short backfire antenna technology for space applications," was recently published in Nature Communications. The partnership between Lockheed Martin and Penn State researchers was critical in making this vision of an improved antenna a reality. "This ongoing collaboration works exceptionally well. We are using our strengths—the understanding of the need and requirements, the ideas and concepts—but we can't do it without the unique skills and capabilities that Penn State offers," said Lier. "Penn State is a world leader in metamaterial-enabled RF systems and the associated electromagnetic simulation and optimization tools required to realize the design and implementation of our proposed concept. We bring Doug and his team the vision, and they do the heavy computational lifting. They are cutting edge with those things." 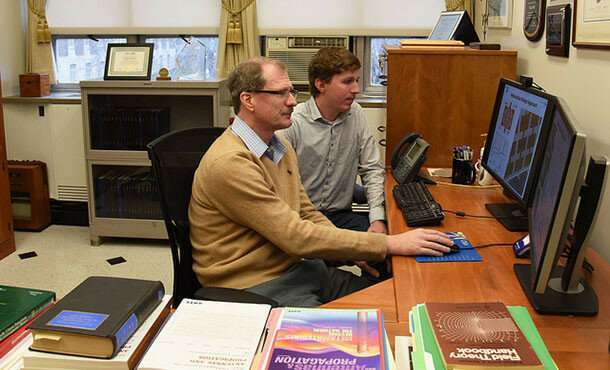 Because Lockheed Martin won the contract for the next generation of GPS satellites, the research team's design may be a perfect fit for future GPS satellite payloads, a fact that Werner and his graduate students find particularly exciting. "What's great about this collaboration is it gives us a focus for this research," said Werner.